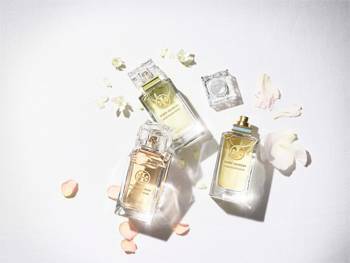 This Spring, Tory Burch introduces Jolie Fleur, a collection of three unique fragrances inspired by the flowers and colours in Tory's garden – rose, lily of the valley and tuberose. Each fragrance captures elements of Tory's style. Each blend comes in a beautiful glass bottle with a signature fretwork top and refined colour accent. Jolie Fleur Rose captures the soft blush colour and aroma of roses in Tory's garden. A feminine and romantic blend" classic rose essential and fresh tea rose made modern with woodsy cashmeran and musk. Notes: rose, fresh tea rose accord, cashmeran, musk, pink pepper, green sap accord, strawberry leaves accord, violet, white amber and sandalwood. Jolie Fleur Verte captures the crisp green colour and dewy aroma of lily of the Valley. A tomboy and easygoing mix with hints of mandarin, neroli oil and jasmine. Jolie Fleur Bleue captures the intoxicating aroma of tuberose paired perfectly with crisp grapefruit, creamy sandalwood and earthy vetiver for an understated and elegant scent. Notes: tuberose, jasmine sambac, grapefruit, sandalwood, vetiver, mandarin, pink pepper, violet leaves, cassis, peony, amber and cedarwood oil. The Jolie Fleur Collection will be available at selected Myer stores, David Jones and Sephora from the 23rd October 2016.